Conditions varied between 8-10 knots of breeze on Saturday to a slightly more rugged 18-20 knots with higher gusts on Sunday. Those more challenging conditions led to two crew overboard situations. In the first instance, the Grand Valley State crew on the J/109 Morning Glory – under the guidance of long-time Storm Trysail Club member and boat owner Carl Olsson – initiated a successful recovery maneuver while sailing downwind. In the second instance, one of the two safety boats swiftly picked up the crewperson who had fallen off of the J/105 Elmo. Both were recovered quickly and unharmed. Boston University took home the overall honors and the Paul Hoffmann Trophy in the hotly contested J/105 class on Young American, with four bullets and a second place in the second largest class in the regatta. Echo, crewed by Vanderbilt University (a first time entrant to the regatta) took home second place in the J/105 class by edging out Drexel University on Fairhope with a tiebreaking first in the third race. The J/44 class, which by tradition is a generally an all-service academy class in the IOR, was won by Maine Maritime Academy on Gold Digger, closely followed by the U.S. Coast Guard Academy sailing their own Glory, just one point ahead of last year’s overall winner, the U.S. Naval Academy on Maxine. The University of Rhode Island ran away with the J/109 class with a 2,1,1,1,1 line score on Emoticon, topping Grand Valley State University on Morning Glory and Tulane University on Growth Spurt. There were three PHRF classes. In PHRF 1, Webb Institute on Oakcliff Sailing’s Farr 40 Blue came out on top, followed by a joint team comprised of crew members from both the U.S. Merchant Marine Academy and Tufts University on the IMX-45 Xcelsior, with Michigan Tech on the Swan 42 Quintessence taking third place. PHRF 2 saw the U.S. 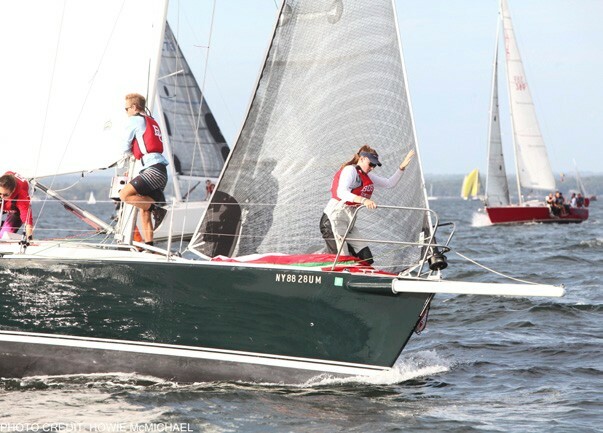 Merchant Marine Academy squad win on their own Tripp 40 Phantom, with the George Washington University team on the Goetz 40 Soulmates in second place and the University of Michigan on the J/133 Antidote a single point behind in third. The class winner in PHRF 3 was Virginia Tech on the X-34 Maudelayne, one point ahead of the J/88 Wings with the University of South Florida aboard. 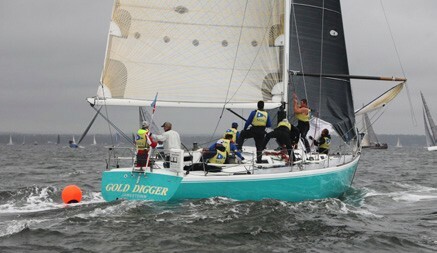 Third place in the class was Roger Williams University on the J/92 Thin Man. Joffre continued, “There is a lot of pressure to perform at your best, but I know that the team is much closer now because of this experience.” This was their first time at the IOR, and they had to win an international student regatta in France in order to earn an invitation to the IOR, with an all-expenses paid trip through a partnership between the Storm Trysail Foundation and the EDHEC Sailing Cup. The Storm Trysail Foundation wants to thank The Corinthians, who started the Corinthians Intercollegiate Regatta in 1983 and ran it until 1999, for transferring their original four perpetual trophies to the Storm Trysail Foundation. These four beautiful trophies bring together the initial regatta with its later reincarnation by Storm Trysail, and begin new traditions for the competitors. The rededicated trophies, the George G. Crocker Memorial Race Trophy, the Edward S. Moore III Memorial Trophy, the James C. Jacobson Memorial Trophy and the Foster Tallman Memorial Trophy, were presented to class winners this year for the first time. In addition, Larchmont Yacht Club donated two perpetual trophies including one belonging to the late Thomas Carroll, a longtime LYC member. The Paul Hoffmann Trophy, named for a Storm Trysail member famed for his success on a series of yachts named Thunderhead, presented by his son Binky Hoffmann, is given to the team that had the best overall performance. The Ed du Moulin Trophy, named for the man who was involved in the management of more America’s Cup campaigns than anyone in that event’s history, presented by his son, Storm Trysail Club Past Commodore Richard du Moulin, is awarded to the boat owner of the overall regatta winner. Results of the 2017 Storm Trysail Foundation Intercollegiate Offshore Regatta are posted at YachtScoring.com.